The garden is doing well. The cats seem to stay out of it and almost everything has sprouted. So far: tomatoes and zuchinni (starts from a friend), scarlet runner beans, garden beans, chard, radishes, oregano, marigolds and cucumbers have shown their leaves– I took pics, but as you might imagine, they are not that exciting yet. 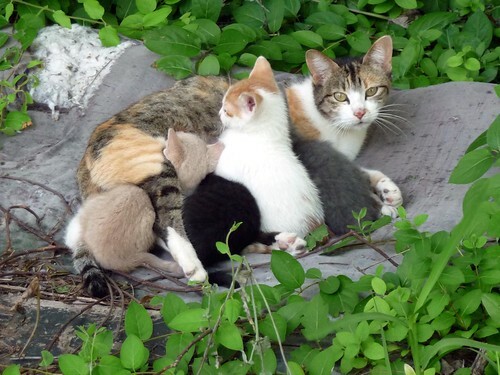 In other back yard news, my mom and I are going to attempt to spay and release all 6 stray cats (above, plus one) that live between both of our neighbors’ back yards. They are so cute, but we definitely do not want more of them. As long as the neighbors feed them, there will be more, so….we’ll see how the whole trapping thing goes. We’re going to a feral cat meeting tomorrow, so hopefully they will give us plenty of tips. I can’t be a cat lady because I’m allergic to cats, which is probably a good thing for me and my yarn. I’m still teaching classes at the shop and wanted to give a heads up that I have a baby sweater class starting this Monday. Email me for more information on the pattern specifics, but it’s a little girl’s pattern (size 6 months, 12 months, or 18 months, and it runs big) and you will learn lots of skills that you can use for adult sized sweaters. Learning them on the smaller scale first is fun because you don’t have to worry too much about fit plus we don’t have to deal with any body issues (haha! ), and you should be able to finish a lot of the work in class. The cost is $60 + materials, and we have yarn options ranging from about $15 to however much you want to spend. It meets 4 Monday nights from 6-8 pm. If you’re interested, call the shop or email me, it’s always fun to have at least 3 or 4 people in a class. I’m halfway through a sock class right now and it’s so fun to see how each of the yarns work up in crochet. 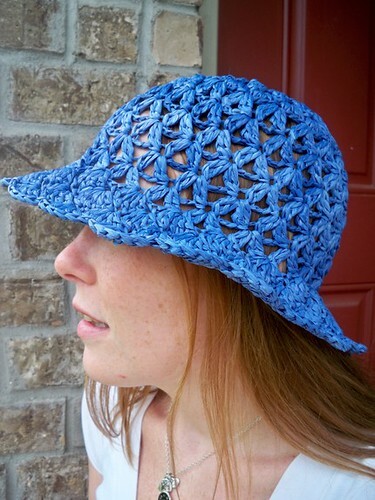 And finally, one of my pattern customers has begun selling the raffia sun hats (from this pattern) in her etsy store. If you don’t crochet, here’s your chance to get one at a very fair price. She even makes them in smaller sizes for kids. I haven’t seen the hats in person, but from the photos and my conversations with Cynthia I can tell you that I think you’ll be getting a quality product. And just so you know, if you want to make something from one of my self published patterns to sell in your shop, just email me to discuss (I do allow it, for a small fee + link exchange). Wow, those buttons were a great find! 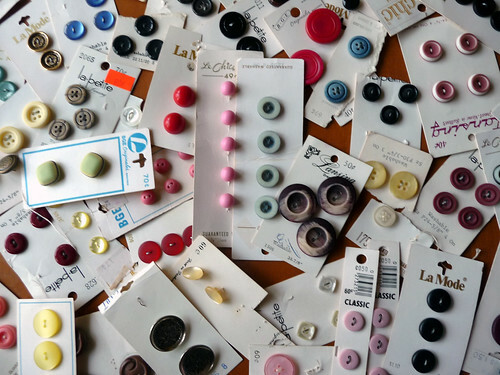 I love buttons too. Hard to get real nice big ones though. So if I do find any, I buy lots!